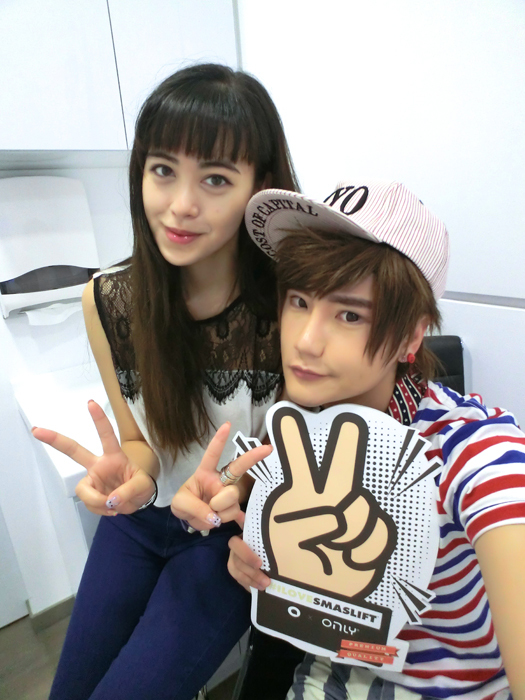 Dropped by O Medical Clinic the other day with Yutaki to try some of their aesthetic treatments! Yutaki & I tried different treatments by the way! I did a facial peel + hair removal, while he did a face-slimming treatment + teeth whitening. These few pictures below look like stock photos but they were actually taken by Yutaki with my DSLR! I think the treatment Yutaki did may be the one on the poster I'm holding, which we took pictures with simply because it was cute lol. If it looks like we were waiting around a lot, it was because we were waiting for the skin test on me to be completed! You see, I've never done these sorts of facial treatments before. I've only ever gone for 2 facials ever in my life, both of which I basically hated. I have pretty sensitive & dry skin that tends to sting whenever I apply most over-the-counter products as those usually contain tons of additives & whitening stuff & whatever else. Which is why I usually stick to pretty mild products & avoid doing anything much to my skin & this definitely includes facials. I've been lucky to be blessed with clear skin for 22 years of my life, until 2013 last year when suddenly I developed skin problems. I've mentioned it a bit on my Ask.fm but didn't blog about it as I was/am currently still waiting for my skin to completely recover from this strange bout. I was originally recommended to try their new Luminosity Laser Treatment. When I spoke to the doctor however about the antibiotics I'm on, he did recognise that it may mean I have a higher chance of getting pigmentation (exposure to laser rays). A small chance, but still. And in his opinion, he felt I shouldn't do the treatment at all until I'm done with the antibiotics. I was kind of stuck... I mean I DID want to try facial treatments to see if it would help my skin, but I was afraid of taking the gamble. And also the pain. LOL. So we decided to do a little test patch behind my ear (where the skin is more sensitive)! In the end the skin behind my ear didn't react at all, so I thought I could take the gamble. At the end of the skin test (about 20 minutes) however, the O Medical Clinic consultants actually recommended I try their Flawless Peel Facial instead which 1) is not painful & 2) does not involve lasers. Which settles my concerns about pigmentation! I was instantly sold upon hearing that it's not painful lolol. And to my surprise, I was also told that it involves NO downtime at all. I always thought facial peels were really harsh & all chemical-y & all but in the end it sounded pretty mild! Here is the treatment room! I love how it looks so clean & calm. Useful to have a sink + mirror so that you can clean off your makeup as well as reapply it after your session! Yes, you can apply makeup right after! Really no downtime! So here's my face after removing my concealer (still got my eyeliner). As you can see, I've got some red marks. This is the pigmentation I was referring to earlier on, as a result of my medicine. The good news is that my dermatologist said this is temporary & that the marks will fade after a few months of stopping medication. At the same time it also helps combat oily skin + wrinkles but *ahem* I choose to believe I don't quite have lines yet lolol. Mandelic acid in the solution has anti-bacterial properties designed to target acne & oily skin problems, while the alpha hydroxyl acid pairing with ultrasonic peeling system helps to brighten skin & lighten dark spots! The treatment will also remove dead cells & promote production of new cells. The whole treatment is actually really fuss-free. The consultant applies the solution, then special lamps & eventually a gel are applied afterwards to cool & calm the skin. It was that comfortable! And pain level... NONE. There was a slight stinging when the solution was first applied, but it was even less than when I previously tried some big-name beauty products from reputable brands. Overall I was really pleased with how my fears of facials were totally appeased. Also changed into tube dress for my SHR Hair Removal! SHR Hair Removal is actually different from IPL! IPL involves firing one intense shot while SHR fires a multiple of milder shots. For this reason SHR is considered safer & less painful than other hair removal techniques. I did waxing for 2-3 years & it is without doubt painful. Bearable, but painful. I recently started on IPL which is much less painful than waxing, but still involves a small pricking sensation each time the laser is applied. Pain level for IPL is maybe... 2/10? Waxing is... 6/10? SHR is... 0/10. Literally. Completely painless. Anyhow I did SHR for both Brazilian & underarm. I've however done IPL for Brazilian before, so I can't say for sure where the results come from as I've less hair to begin with. For my underarms however, it was my first time doing anything other than shaving. So the other day in the shower I was thinking to myself it was probably time to shave. I mean I don't have a fixed timetable. I just roughly know it's time. But then I checked &... no hair. So I tried to recall when was the last time I shaved. And then I realised... I couldn't remember. Thank you SHR! Painless & effective! Also took back this face mask for hydration! It's meant for post-laser treatments, but it's good for me since I have dry skin. The MCM ONLY mask is oil-free, non-sticky & ideal for sensitive skin. I tried it one night later & it's really very hydrating! As for the effects of the Flawless Facial Peel, I did notice my skin being a little drier the 1 or 2 days following the treatment but I simply spammed moisturiser & it was fine after that. I would say the full effects of the treatment are more visible about 5 to 7 days later, when the skin is more... rejuvenated? My skin felt smoother & looked much less patchy when I applied makeup. Even my boyfriend remarked that my skin looked better! So glad that the O Medical Clinic consultants recommended the facial peel treatment to me! That's what I liked the most about the clinic - that the consultants are very professional & do not simply aim to promote one treatment over another instead of what's best for your skin. While I was personally struggling with trying the laser treatment or not, all the staff (doctor + consultant) repeatedly told me to err on the side of caution & postpone the treatment entirely. And when I thought I should just go ahead & try it anyway, they recommended another treatment they thought would be more suitable for my case. During the entire treatment my consultant explained step-by-step what she was doing as well as what she would be doing next, which was very reassuring. I was never left hanging wondering how long I would be lying there, whether I can open my eyes & so on. The consultant informs you every time before touching your face so you don't ever get startled (your eyes are closed). Once again, I liked the professionalism & it helped me feel much better about my first time. And FYI, current SHR Hair Removal promotion! 6 comments on "ONLY Aesthetics x O Medical Clinic"
It's funny how the street where the clinic is sounds like your name! Hi, it's been 2 months since your SHR treatment. Any updates? Thank you! Hello! For hair removal to be permanent you need to go for multiple sessions :) In that way it's the same as IPL, which usually takes 6-12 sessions. For underarms I dunno how many sessions are required! I only went for 1 & the effect lasted a few weeks (how many I can't recall), but then hair started growing again!